Well, no, history isn't bunk, it's very important, but you have to admire the power of the statement. There certainly are occasions when history gives a wrong steer, and I think I've just heard one. The problem is, that if you try to predict the future based on experience from history, you assume that things will continue in the future the way they did in the past - but this misses out on the way sudden major step changes can (and often do) totally throw the effectiveness of the prediction. Despite that disbelief, the curve went on, with Sputnik going into orbit on schedule in 1957, and twelve years later man was on the Moon. The idea of this example is to show how exponential growth can transform things in a shocking way – and it’s a great example up to a point. Yet in its use of carefully selected data it is also extremely misleading. To start with, the world didn’t end with the introduction of space flight. Bear in mind that as much time has now passed since Sputnik was launched in 1957 as had gone by between the Wright brothers’ first flight and that satellite launch that triggered the space race. Even with linear growth we would by now expect to be crossing the solar system with ease – with exponential growth, we should be hopping to the stars after fifty years has passed. It hasn’t happened. Our space vessels are no quicker than they were in the Apollo days. Look a little deeper, and things are even worse as far the growth curve goes. Broderick has compared apples with oranges. His story begins as a description of mass travel speed – the rates that ordinary people can achieve – but ends with specialist travel speed. Very few people have become astronauts. If you stick to the curve of mass travel, something even more remarkable has happened. From the Wright Brothers’ handful of miles an hour we did see immense jumps with the jet plane, and then with the supersonic Concorde at around 1,300 miles an hour. But since Concorde went out of service, our fastest mass travel speed has dropped to less than half its previous value. Not only are we failing to ascend an exponential curve, or even a linear curve, we have actually plummeted backwards, with no real contender in sight to reverse this. The reason I bring this up now is I've just heard a couple of academics arguing about whether English will continue to be a world language. One, arguing from history, pointed out how quickly 'universal' languages get dropped. But all of history before English has been without the Internet, email and other high speed world communications. I personally think this totally changes the game. Yes, English might be supplanted by another language - but I don't think history is any use here in predicting the outcome, because the situation is so dramatically different. 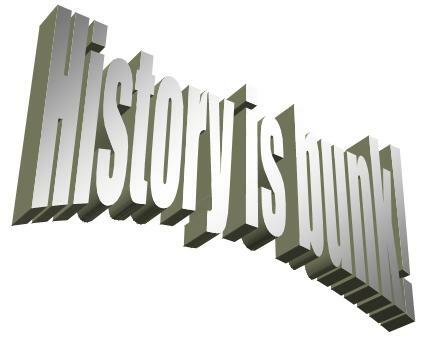 Here, at least, history is bunk.